courtesy of Industrial Mechanical Specialties, Ltd. 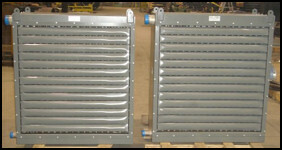 There are many applications for steam coils and unit heaters in the industrial and processing fields. Lacking the sizzle of high technology, steam coils are simple, straight forward pieces of gear that are intended to transfer heat from steam to air. While simple in principle, their importance in process or application is notable. You are heating that air because it needs to be heated in order for something else to continue working properly. Steam coil thermal performance is predictable and well understood, making sizing of the coil tube and fin components a relatively simple task. A critical and practical element for steam coil selection is specifying attributes that will deliver ruggedness and longevity to reduce the probability of failure due to normal wear and tear associated with the process and installation environment. Employing heavier gauge fins and tube walls can provide a longer service life. Cabinets or casings fabricated of corrosion resistant materials, such as stainless steel, may also lengthen the service life of the unit. 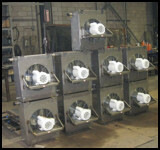 Any motors, mountings, fan guards, or other hardware should also be evaluated for upgrading to enhance service life. Of course, there is always cost involved. Examining the true cost of downtime to repair or replace a steam coil will likely show that some carefully considered options are well worth the comparatively small additional cost. Consult with a coil specialist. Discuss your application and see what construction enhancements will deliver longer on-line performance for your process.